The Little Rock Christian Academy Warrior football team defeated longtime 5A powerhouse Pulaski Academy in the 5A state championship on December 2 with a score of 52-38. 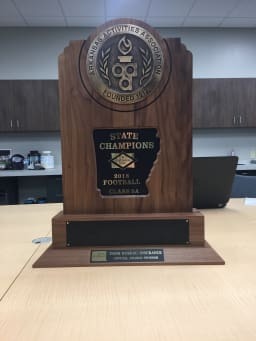 Fourteen years after the football program was established in 2004, Little Rock Christian brought home its first state football championship, not too bad of an accomplishment when compared to other successful programs in the state. According to the Arkansas High School Football Almanac, PA’s football team was founded in 1977, and won their first championship 26 years later in 2013. The almanac also shows that it took a dominant Fayetteville High School football program 103 years to win their first state championship. The Warriors championship season ended with a 13-1 record, their only loss coming from Pulaski Academy earlier in the season. While only his first top spot at LRCA, this is Head Coach Cohu’s fifth state championship overall and his fourth state championship as a head coach. His previous state titles came in Alabama and Virginia high schools. Additional accolades followed the winning Warriors championship title. Garrett Sansom won the Brandon Burlsworth Lineman of the Game award for his display of character and sportsmanship in the War Memorial face-off. Coach Cohu was named Arkansas Farm Bureau Insurance's 5A Coach of the Year, and Justice Hill won the Arkansas Football Gatorade Player of the Year award, recognizing the most elite high school student-athletes in the country. Hill was also named Farm Bureau Insurance's 5A Offensive Player of the Year. Grant McElmurry was one of three finalists for Farm Bureau's 5A Defensive Player of the Year, and Phillip Dileo was named a Hooten’s & Arkansas Air Guard Scholar Athlete of the Week for his work on the field and in the classroom.